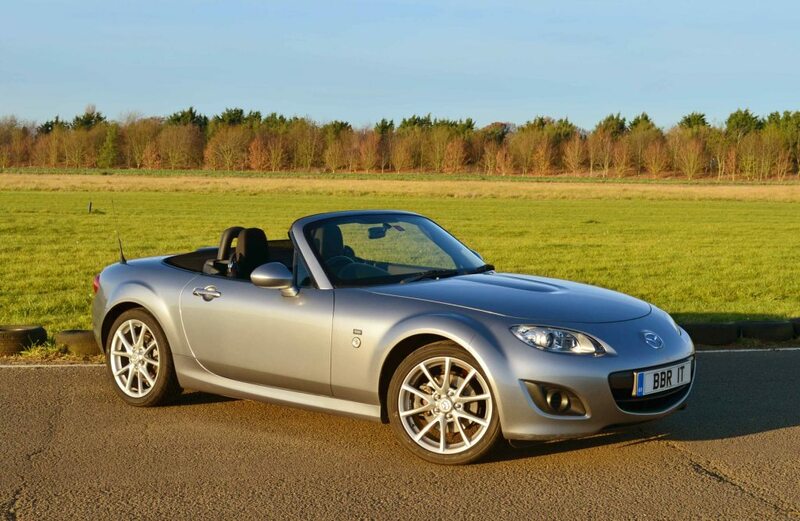 Leading automotive performance specialist BBR has extended its successful portfolio of Mazda upgrades with the launch of a new tuning package for 1.8-litre variants of the MX-5. 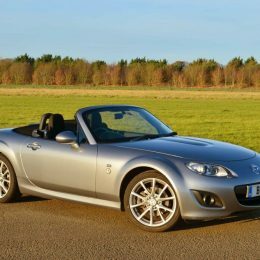 Delivering 175 bhp allied to a 143 lb.ft of torque, the ‘Super 175’ package is a bolt-on upgrade designed to significantly enhance the power output of the smaller capacity ‘NC’ versions of the Mazda sportscar. The BBR ‘Super 175’ has been developed using techniques learnt on BBR’s popular ‘Super 200’ conversion for the flagship 2.0-litre MX-5. As with the ‘Super 200’ upgrade, the tuning philosophy with the BBR ‘Super 175’ package centres around improving the breathing on the 1.8-litre engine. As such, BBR has developed a pair of exclusive camshaft profiles with unique lift and timing specifications designed to maximise both the spread of power and peak bhp. In conjunction with a 4 into 1 tubular stainless steel exhaust manifold and extensive in-house engine management system recalibration, the BBR ‘Super 175’ package delivers significant power gains from just 3000rpm, exceeding standard power and torque outputs at every point in the rev range to maximise everyday driveability. 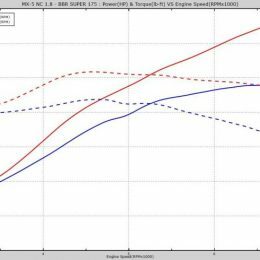 On BBR’s in-house dyno the results are that a ‘Super 175’ equipped 1.8 MX-5 produces 143 lb.ft of torque (15 lb.ft more than the original) peaking at the same engine speed (4750 rpm) as the stock motor. Peak power is boosted to a genuine 175 bhp at 7300 rpm, a remarkable tested gain of 39 bhp. 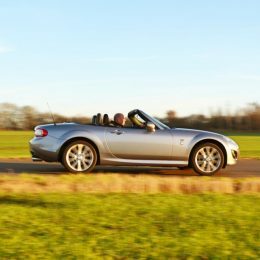 On the road the extra torque, power and throttle response from the BBR ‘Super 175’ combine to produce an upgraded Mazda MX-5 which feels much quicker and far more willing, eager and exciting to drive than ever before – whatever the traffic, weather or road conditions. 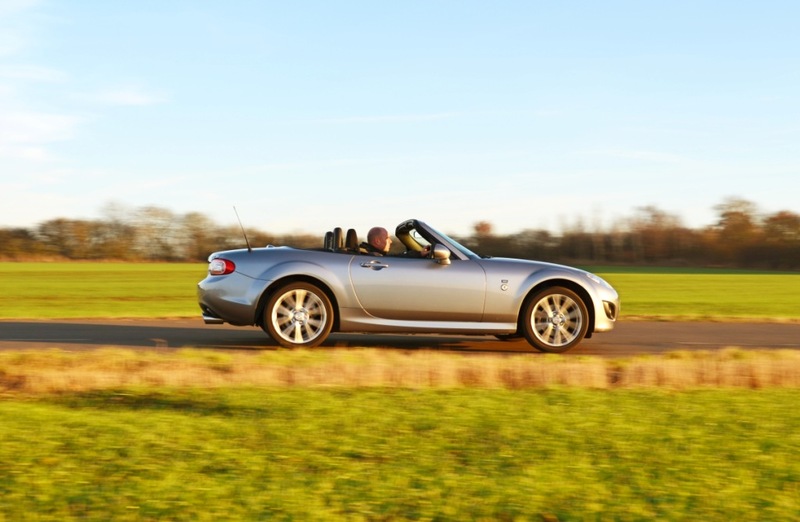 Careful development by BBR has ensured that the ‘Super 175’ package is fully UK MOT emissions compliant and will run on either 98 or 95 octane rated petrol, with all the existing Mazda electronic fail safe systems untouched and fully functioning on converted cars. Mindful of both costs and occupant comfort for high speed, long distance driving, the standard exhaust centre section, catalytic converter and rear silencer are retained with the BBR Super 175 upgrade. However, the package includes a set of 3.5 inch branded stainless steel tailpipe trims which are adjustable to accommodate different bumper options on Mk3 / 3.5 / 3.75 models. In addition, exclusive yet subtle BBR wing and bootlid badging is included in the Super 175 upgrade. NOTE: BBR will refund £100.00 should customers elect to return the ProEcu hardware unit in good unmarked condition once BBR’s StarChip has been installed.